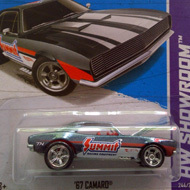 167/250 is part of the HW Showroom series and the 2013 Super Treasure Hunt set. 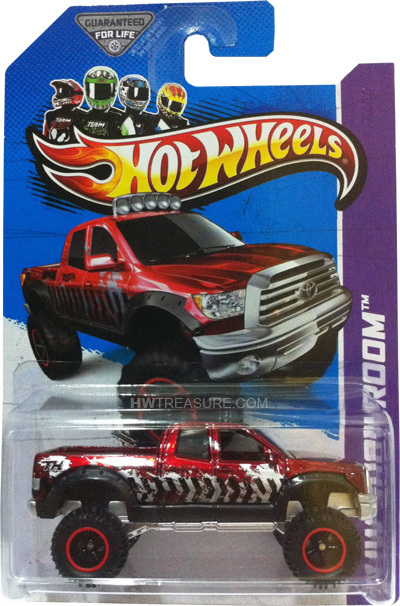 The truck boasts dark red Spectraflame paint with black & grey graphics on the sides and back, “TH” and the Hot Wheels logo on the sides, and “PLAY DIRTY” on the rear. 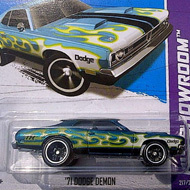 It has tinted windows, a black interior and truck bed, black 5-spoke Real Rider wheels with red rims and off-road tires, and a chrome plastic Malaysia base. The Tundra first appeared in the 2012 New Models series and is based upon the actual vehicle.